Yes I’ll just be over here (I wish) LIVING IN COLOR!!! This seems like yesterday, that I was in Hawaii having the best BIRTHDAY celebration EVER. 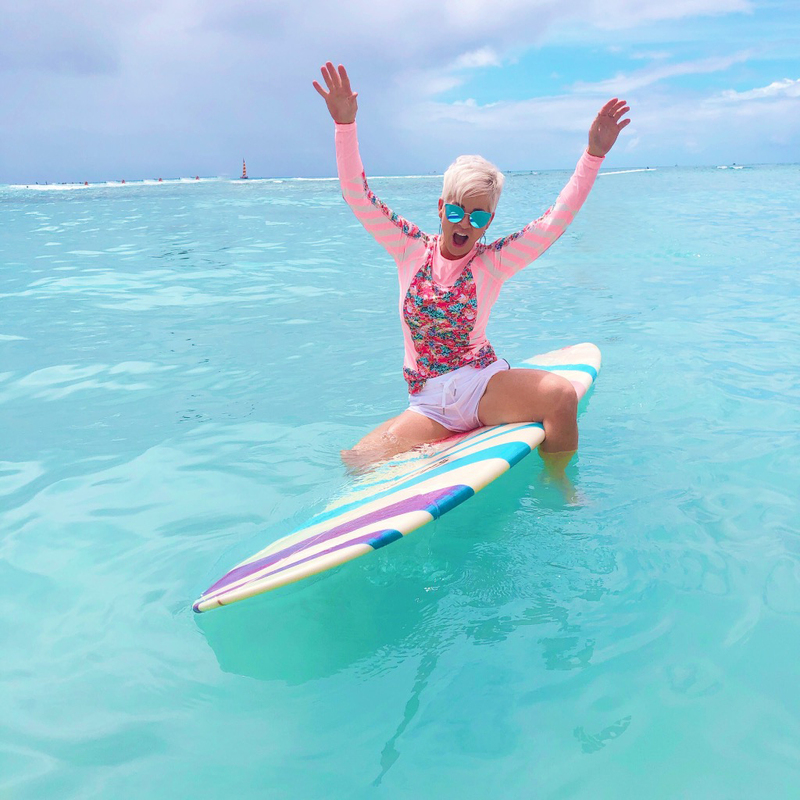 I had packed with me all of my COLORFUL swimwear, hoping for a day that I would have a fabulous pink surfboard to go with it! Well…..you see my wish came true and it was the most fabulous day out on the beach with my girl! I will not ever not LOVE COLOR! I’ve blogged about it over and over again. I’ve had this rashguard shirt for a long time. It’s from Lululemon and has a matching swimsuit to go with it. My shorts are also from Lulu but vintage as well. I’m linking up a really similar look here in thistle blog. THIS is a GREAT WAY to DRESS for the BEACH! You’re mostly protected from the sun, but still look like you’re BEACH-ready to play! Did you know that COLOR can affect your mood? Do you feel it does? What you put on when it comes to COLOR can truly put you in a happier mood. You know how interior designers create certain rooms with specific color schemes to invoke a particular mood? Well…..why not try that with your clothing? When I’m all decked out in color I HONESTLY feel I’m in a happier mood! What is the correlation between your mood and the colors you put on each day? A week or so ago I went to a funeral. I wore a very cheerful bright colored dress. I asked my significant other what he thought about me, if he thought I looked too BRIGHT! He said to me……YOU wear whatever you want and you’ll look amazing……and everyone else will think the same! He is the SWEETEST man ever! I thought about that…..COLOR at a funeral. This man’s funeral was a happy celebration of his life and his family. Everyone should have been wearing color to represent just that! So now for the good part……my favorite colorful pieces right now….all SO FUN…all SO GOOD…….and all will put YOU in a HAPPIER mood!!!! Living in COLOR is much more fun than not! I’ll be blogging tomorrow on this very thing again…..with the most fabulous dress for spring…….EVER! It’s SO CUTE! Stay tuned! Last week I did a fashion segment on ATHLEISURE WEAR on Good Things Utah here in Salt Lake City. Here is a link to my segment! It was so fun and always a blast to visit my friends Nicea, Reagan, Alli, and Brian on set! They have been so good to me in more ways than you’ll ever know! You can find it here! I will have links to what the ladies were wearing in a blog post over the weekend!!!!! You inspire me every day WOW is all I can say! Where did you get your outfit! Hi Jan…..are you talking about the outfit on the beach or the outfit I wore on GTU? That one is here. The other (beach) is linked here in the blog post.